ACPL provides exhibition spaces throughout Athens County in its seven library buildings. Artists, makers, collectors, and craftspeople are warmly invited to contact us about this exhibiting opportunity in a supportive, community atmosphere. Exhibits are on a monthly basis with details posted on this site, and exhibitors ranging from students to professional artists are encouraged to share their work or collections at multiple branches. There is no exhibit fee. The exhibition areas available at this branch include a 42’ wall in the main Circulation area, a public meeting room, glass cases, and hanging space in the children’s area. Exhibits rotate on a monthly basis with individuals and groups encouraged to exhibit. 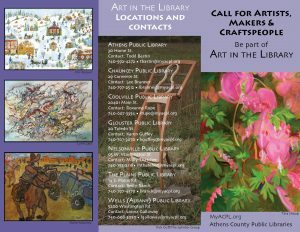 Meet-and-greet artist receptions with refreshments occur monthly and are supported in part by The Friends of the Athens Public Library. If interested, contact the Athens Public Library Art in the Library coordinator, Todd Bastin. The Coolville Public Library is new in promoting the artwork and exhibits in our county library system. Although limited space is available for artwork and displays, Roxanna Rupe, Branch Manager welcomes interested individuals in displaying in the library. The Glouster Public Library is interested in artists and exhibitors displaying their creative work or collections though out the library. Exhibited items can be displayed on top of the book cases and framed artwork can be hung from the ceiling. If you are interested in displaying items in the library please contact the Branch Manager, Karen Guffey. The Nelsonville Public Library is an active member of the arts community with participation in Nelsonville’s Final Friday events. Every month a new artist or artist’s group is featured throughout the library. With over 92” of display space throughout the library and two locked display cases the library enjoys a variety of exhibitions throughout the year. 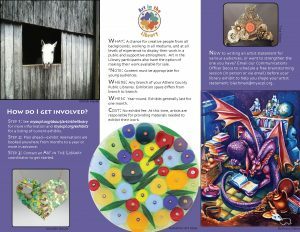 Patrons interested in exhibiting in the library can contact Nelsonville’s Art in the Library coordinator, Molly Thatcher. Thanks to generous donations in memory of William Rickey, The Plains Public Library has a beautiful display case that is well lit and locked. The library strives to present new artwork monthly. If you are interested in displaying your work, please contact The Plains Library Art in the Library Coordinator, Betty Ranck. The Wells Public Library has space available for exhibits in the public meeting room and the magazine area. In addition a locked display cabinet for smaller display items is available in the entrance of the library. Persons interested in exhibiting can contact the Branch Manager, Mary Van Doren.